This party was over a year ago, but I figured healthy spring recipes with wine pairings won’t go out of style. So I’ve come back and made a few updates to the post. When I volunteered to help Jodi with the North Suburban YMCA’s annual fundraising campaign this spring, I thought hosting an “Almost Spring” tasting party would be a great way to sample some health and tasty foods while supporting the Y. After all, healthy living is one of the cornerstones of the Y’s work. We also shared at the event how the Y is committed to ensuring individuals and families of all backgrounds have the opportunity to participate in their great programs. Definitely a cause worth supporting! Some folks seem to think healthy eating means sacrificing taste, this lineup of tasty recipes provided a great chance to dispel that notion! Of course, good food ought to be enjoyed with good wine and friends. So in addition to featuring healthy recipes, the other fun part of the event was finding good wines to pair with each course. As is often the case, I got some good ideas and wine for this from my friends at Pairings Wine and Food. We had a fun group of 15 people enjoying this lineup with us. I served tapas style portions of each course, so that people would be able to enjoy the full lineup. Our guests were eager to get the recipes and wine info, so I guess it’s a good sign that the menu worked well, and that you might want to replicate some or all of it for yourself! 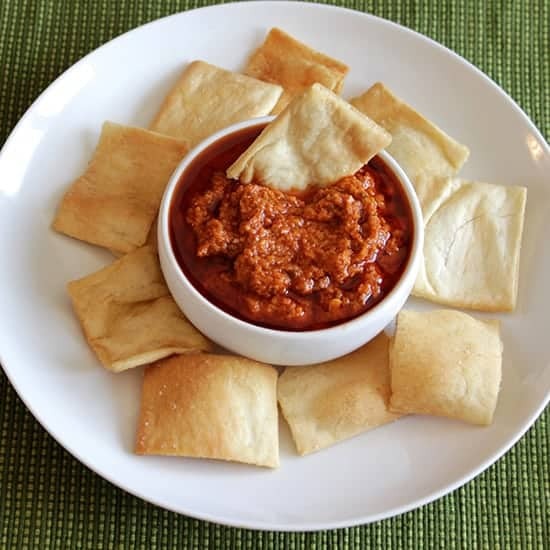 This spicy red pepper dip of Turkish origins, know as “Muhammara”, is something I make frequently for gatherings when taste is the only consideration. But made with olive oil as opposed to cream or cheese, along with healthy ingredients like walnuts and the pomegranate molasses, this seemed like the perfect start to our health + tasty themed party. I figured we should still put some cheese out, too, but offered two that are somewhat healthier. Goat cheese is easier for some people to digest, along with being lower in fat than some cheese, so we featured a tasty one from Pairings. Parmigiano is also lower in fat than cheddar, and I got a great serving idea from one of the cheese gurus at Whole Foods Woburn–dipping the Parm in some honey. A very tasty idea! Bubbles are a great way to whet the appetite, so we served this with a Mionetto Prosecco. 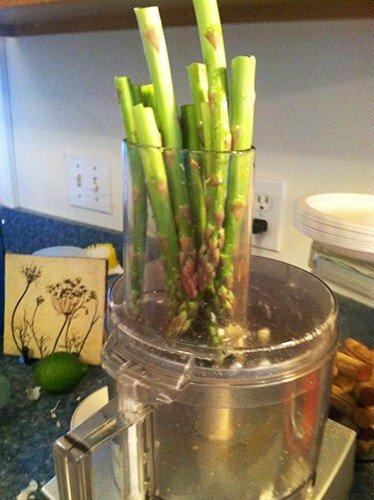 Raw veggies are healthy, of course, but asparagus isn’t one we typically eat raw. But sliced thin and tossed with tasty Parmesan dressing, this is a tasty and creative way to serve asparagus. And the asparagus is starting to look very good in stores now as spring approaches. Get the Food and Wine recipe here and try this for yourself! As you may know, asparagus is one of the trickiest foods to pair wine with. The cheese in this dish provides a “bridge”, something that does go well with wine that you can focus on in coming up with a pairing. I asked Ray from Pairings for help with this one, and we are all very pleased with the result. The Fondo Antico Grillo Parlante, made from the Sicilian white grape Grillo, has a nice fresh crispness that worked with the lemon in the dressing. I also got a bit of salinity in this–perhaps from the vineyard’s proximity to the sea? That worked well with the saltiness of the cheese. 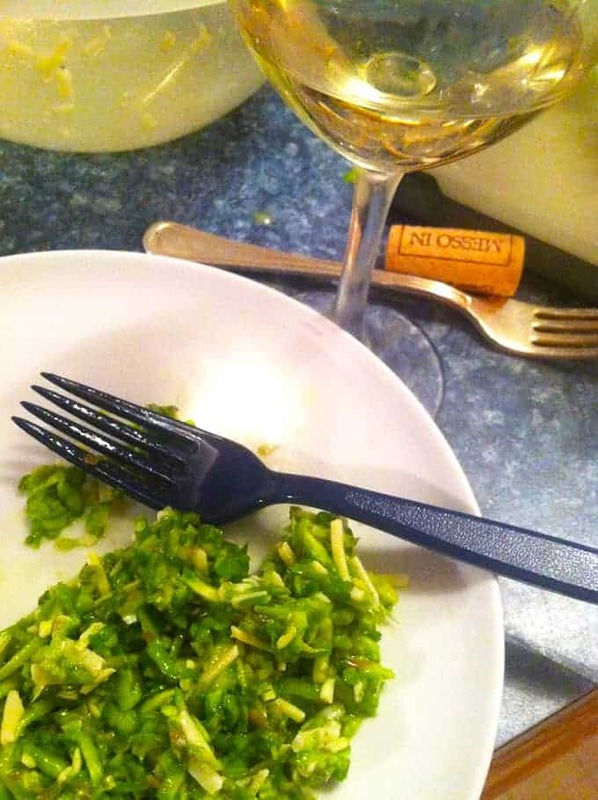 This was one of our most popular and commented upon pairings! Food doesn’t get much healthier than nutrient dense kale, but some people find it challenging to enjoy. I love it in kale soup, but have also come to enjoy featuring it in this pesto recipe I’ve developed. I use a bit of arugula along with the kale, which along with the garlic and red pepper flakes gives this pesto a nice zesty kick. I’d say our guests were pleasantly surprised by this one! I served the kale pesto with bowtie pasta, though the photos here are from another time when I tossed it with linguine. Good both ways! 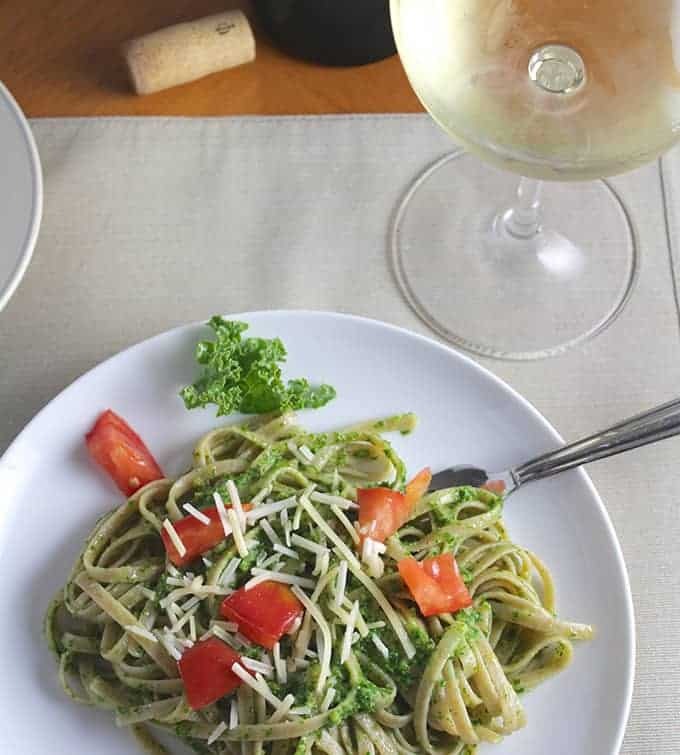 Sauvignon Blanc is the classic pairing for pesto, but I like to mix it up a bit! The Saint-Peyre Picpoul-de-Pinet, at about $10/bottle, is a great, versatile wine we have a lot here. I’ve found it can work quite nicely as a pairing for pesto, whether it be this kale pesto or the more typical basil pesto. With the kick in this kale pesto, next time I might try something with a touch of sweetness, such as a Gewurztraminer. 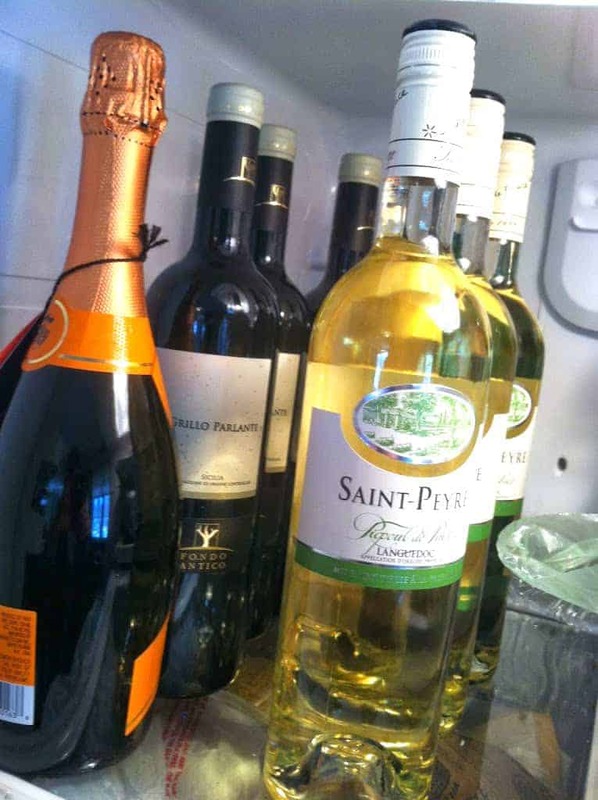 looked like a party ready to break out in our fridge! 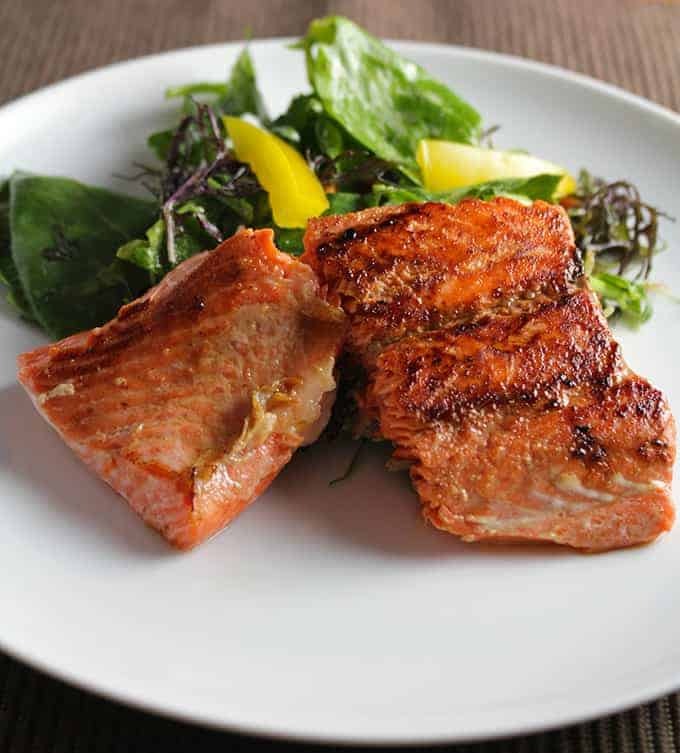 Salmon is my favorite fish, and a natural to feature in a health plus tasty menu. As a healthy bonus, this salmon gets served over some sauteed spinach with cannellini beans. I’ve mastered a technique for pan searing salmon thanks to the recipe in Barbara Lynch’s Stir: Mixing It Up In The Italian Tradition, which I broke out again for this party. It’s a great cookbook, picking it up is one way to get this recipe. I’ve written up the basic pan-searing method in this post, just skip the soy sauce to do the lemon olive relish. For the relish, it’s basically the juice from one lemon, along with some olives, parsley and a bit of white wine vinegar. I suppose you could make a case for a full-bodied white with this, given the citrus element. But Pinot Noir is my preferred option for salmon, and that’s what we went with. The 2012 Hahn California Pinot Noir was a big hit with the crowd, and I didn’t even tell them it was under $15 per bottle! 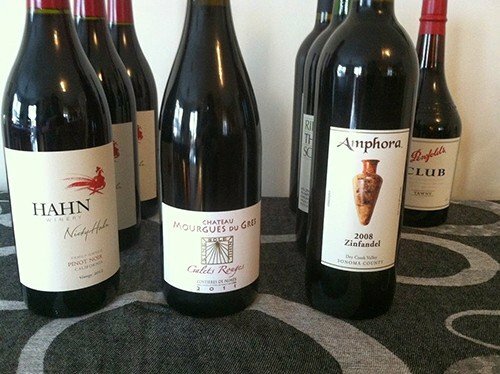 Your not going to find many pinots this good for that price. Pork tenderloin compares favorably with chicken in terms of providing a fairly lean source of protein and minerals, and sweet potatoes are another nutrient dense food. OK, so that’s how these items made the healthy part of the lineup. These recipes I’ve developed definitely pack the flavor! 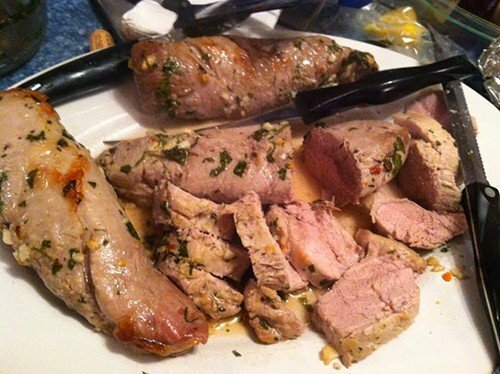 Cilantro-Lime Marinaded Pork Tenderloin with Chipotle Cream has a nice kick, and goes perfectly with my Sweet Potatoes Mashed with Cumin-Sage Butter. For the healthy theme, I cut back on the butter a bit, and used half regular butter and half Earth Balance spread, still quite tasty! Meat with some spice? My first instinct is to go with a good zin, and I trusted my instincts for this pairing. I had recently sampled a great lineup of wines from Sonoma, so I went with the 2008 Amphora Zinfandel from Sonoma’s Dry Creek Valley. This big, robust red didn’t disappoint…well, except for the fact that when I went back to get more bottles for our crowd, Pairings had sold out of it! Oh well, I grabbed a bottle of Ridge zin for our backup after the Amphora had been finished, a solid backup. Sorry, by the time I was serving up course number four I wasn’t getting very detailed tasting notes down! I love reading news stories extolling the virtues of things like chocolate. In case you needed another reason to eat it, here’s an article on the 10 health benefits of chocolate. Combined with vitamin rich strawberries, it must be about as healthy as it gets, right? Dessert doesn’t get much easier. I just shaved a cup or so of good quality dark chocolate that I got at Whole Foods, heated with a tablespoon of milk and a dash of extra sugar until it was liquefied. 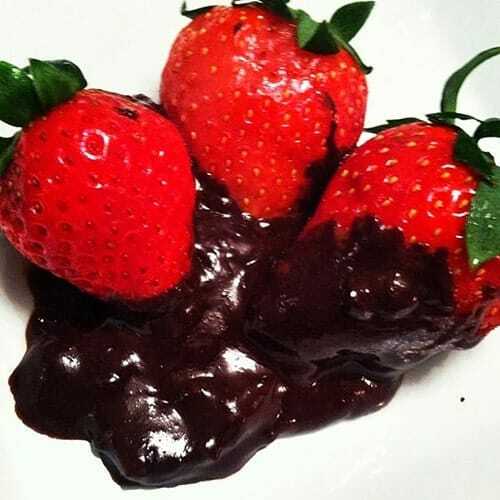 Put a little dollop on a plate, place the berries on top and give them a little twist to partially coat with chocolate, and you got a great looking and tasting dessert! We had a humble port ready to go with this, that I knew tasted pretty good with chocolate. 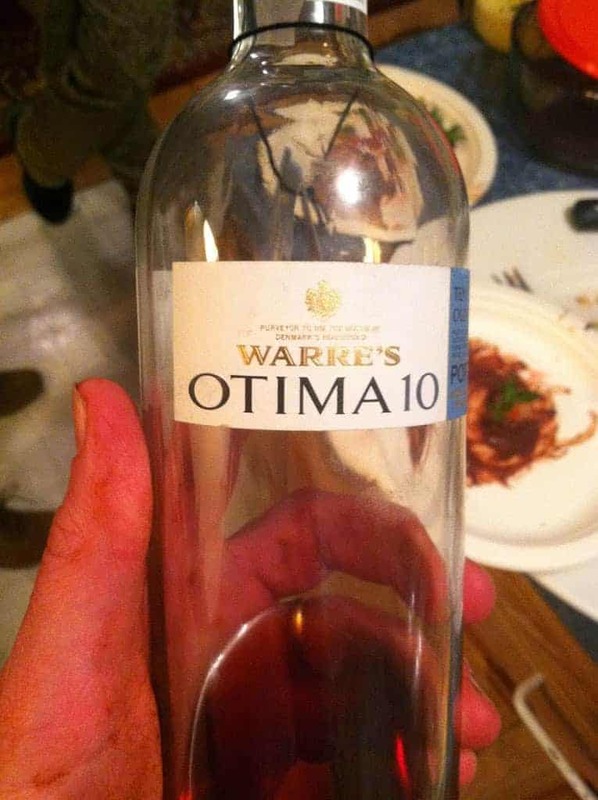 Then, much to my pleasant surprise, one couple that came to our gathering are port connoisseurs, and brought an awesome bottle of Warre’s Otima 10 year old tawny. A great finish to the evening!